How do 3D movies work? Essentially, they present the audience with two slightly different views of the film. How this is done varies with different technologies. 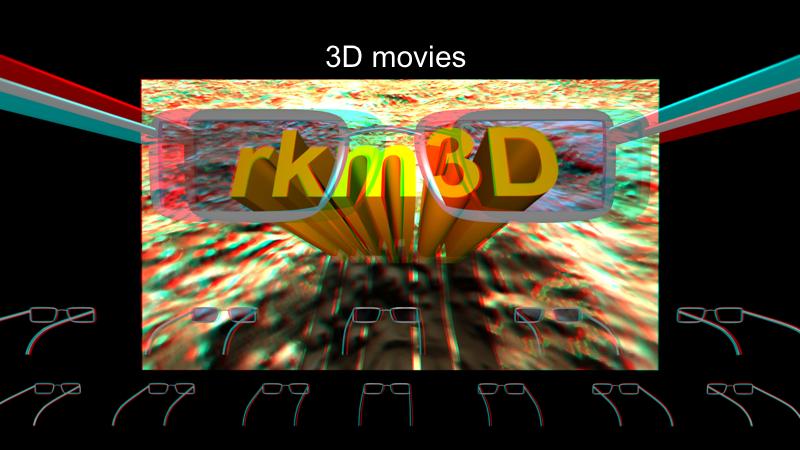 Originally, 3D movies used the anaglyph technique, using red green glasses. This is the technique that you must use to appreciate the 3D graphic on this page, since computer screens are still limited with respect to 3D. Increasingly, cinemas make use of polarizing filters to distinguish the two viewpoints, and the audience wears polarising glasses. The polarising filters can be linearly polarizing or circularly polarizing. Circular polarisation is rather difficult to understand but it does have the advantage to being more tolerant of head movement on the part of the viewer. Polarization has to do with how the light wave is oriented with respect to its direction of travel, whereas colour has to do with the wavelengths of the light. Because polarizing separation of the stereo views does not exclude certain colours (as happens in anaglyphs) the movie can be viewed in a much more convincing colour palette. See an animation of a circularly polarized wave. See a diagram of linear to circular polarization. Many movie theaters now show films in 3D, using cheap polarizing glasses that can be recycled after the watching the movie.